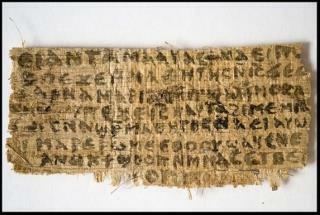 (Newser) – Since Harvard University professor Karen King first reported in 2012 her discovery of what appears to be an ancient papyrus in which Jesus is suggested to have a wife, the authenticity of the so-called "Gospel of Jesus' Wife" has been the subject of much claim and counterclaim. Even the very ink is hard to test because the papyrus scrap is so small. But now LiveScience is reporting that new ink research conducted at Columbia University suggests the document is not a forgery and could indeed date back to ancient times, though researchers aren't revealing more until their peer-reviewed findings are published. King isn't saying much, either, though she did write in a letter in the Biblical Archaeological Review that "when discussions and research are ongoing, I think it is important, however difficult, to stay open regarding the possible dates of the inscription and other matters of interpretation." The values espoused by Jesus as portrayed in the Bible are good enough for me to live by, and I don't care whether he was gay or straight, married or single, son of a mother who was or was not a virgin. All that is irrelevant to the message of Jesus. If I remember correctly, Jesus was a Jewish rabbi.. Back then (maybe still today) Jewish men were expected to be married...especially a rabbi. So, did Jesus just say he was a rabbi but really didn't follow the marry rules? I don't think so. Let the hysteria begin.